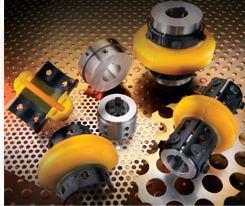 A - Two-piece flex element design allows for simple replacement without disturbing hubs or moving and realigning connected equipment. C - Adhesive coated high strength carbon steel shoe esists corrosion. 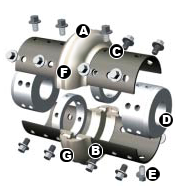 D - Easily aligned reversible hubs accomodate multiple shaft gaps. Hubs are available in rough bore, custom bore, or bushed designs. Optional hub materials are available. E - High grade capscrews are provided with self locking nylon thread patches. Stainless steel capscrews are also available. F - Torsionally soft polyurethane element cushions shock loads, accomodates unavoidable misalignment and is compatible with most environments.